THE SCANIA stand at the Brisbane Truck Show in May is set to have heads turning due to the addition of two production units of the extremely exclusive Black Amber special edition R-series prime mover. The Black Amber ambience builds on the standard high specification luxury feel by adding black leather seats with carbon black centre sections and orange V8 graphics. The trucks - the V8-powered R620 and R730 - will both come with the spacious Scania Highline cab and both supplied in 6x4 configuration. The R730 Black Amber will take pride of place on the Scania stand, providing an irresistible magnet for fans of highly personalised trucks across Australia. The Black Amber paintwork - in dark brown metallic - features chrome detailing and badges, and matte or high-gloss black graphic accents visible from almost every angle. Special high quality materials abound in the interior, including additional features that enhance comfort. Numerous Scania V8 and Griffin symbols are in evidence inside and out. "Scania fans in Australia now have the chance to buy something very exclusive based on the Scania V8," says Kristofer Hansén, Scania's Head of Styling. "We have produced a design that stands out in any crowd. "Whether from the outside or inside, there is no doubting the special care and attention that has gone into this limited series of trucks," Hansén says. 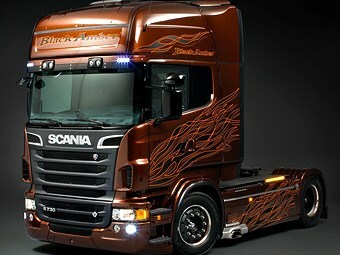 The factory collaborated with well-known Scania enhancer, Svempa, to produce the Black Amber edition, which follows the success of the recent Dark Diamond special edition. Black Amber is a rare dark variety that serves as inspiration for this limited edition Scania V8. The paintwork is decorated with black carbon 'flames' with light amber outlines. The front grille and front air scoops are finished in Brilliant Black, as per standard V8s, while a striking high-gloss Piano Black finish is applied to side and front mirrors, windscreen surrounds, door hinges and the V8 badging near the door handles, and the rear of cab bar hosting the Suzi coils. There is also added sparkle, with bolts for various external attachments polished up, along with the wheel nuts on the now gloss black aluminium rims, which are complete with chrome finisher rings. The Black Amber metallic finish extends to the sideskirts and rear-mounted battery case, while the full-size catwalk is finished in Brilliant Black, accessed via a chrome step set above the side-exiting, polished, stainless steel exhaust pipe. There are Xenon spotlights in sun visor set in Piano Black trims, while safety is enhanced by LED safety brake lights set into the rear edge of the top of the side air deflectors. Inside, the Black Amber ambience builds on the standard high specification luxury feel by adding black leather seats with carbon black centre sections and orange V8 graphics. A black perforated leather covered steering wheel with Black Amber inserts is a highlight, while red LED safety lights on the lower door panel, black leather centre floor mat with Black Amber V8 trim strip, Black Amber rear wall panel - signed and numbered - join black driver and passenger floor mats with black borders. Click here to find Scania trucks for sale. Click here to find new specs for Scania trucks.